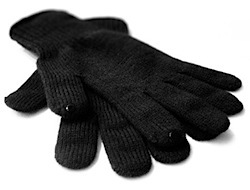 The temperatures outside are dropping rapidly, and many of you will find your hands wrapped in thick gloves. And then suddenly, an important phone call drops in. Unless you’ve plugged in your earphones, or connected your Bluetooth headset to the iPhone, it will take quite a long time to get your hands free to slide the button to speak. So how to answer this important call quickly? For those of you finding this disgusting, but still don’t want to run around with cold fingers, consider buying some fancy iPhone-enabled Dots Gloves.